If you follow me on Instagram or Facebook you might have seen that I totally fell in love with a new cocktail while we were on our cruise recently. The Carnival Cruise ship we were on (The Sunshine) had a “fancy” bar on board called The Alchemy Bar and they had an amazing cocktail called a Cucumber Sunrise that became my new favorite! Everytime I got one I’d carefully watch them make it (which they do with a lot of flair-think the movie Cocktail!) so I could recreate it when I got home to share with you. 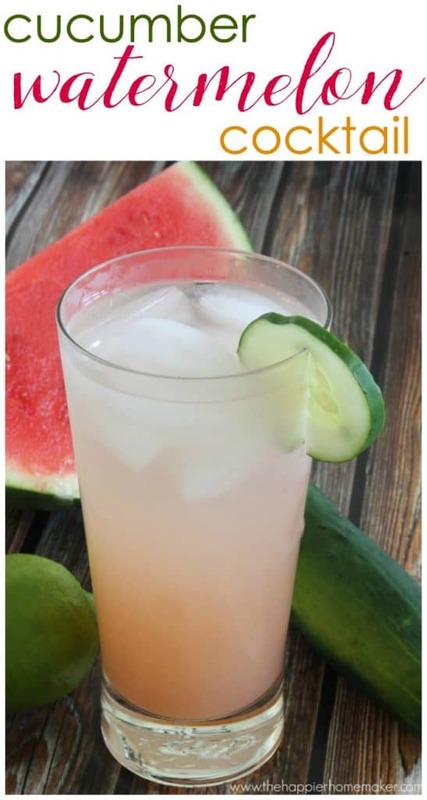 Mine isn’t exactly the same as theirs but it is close enough and I think you’re going to love the flavors in this Cucumber Watermelon Cocktail! To make the cocktail you’re going to need a cocktail shaker and a muddler-I got mine at World Market. Muddle (crush) the watermelon and cucumber at the bottom of the cocktail shaker. Really squish it up to release all of that amazing flavor! Add the orange juice, lime juice, vodka, and simple syrup. Shake vigorously and pour into a highball glass filled with ice. Garnish with a cucumber and serve immediately-it is one of the most refreshing and delicious drinks I’ve ever had! If you’re not in the mood for alcohol you can make it without as well-I’ve subsituted sparkling water for the vodka and it’s just as amazing as a virgin cocktail! Have you ever had a cocktail with cucumber in it before? If you have please leave me the recipe-I love anything cucumber flavored and would love to try it! previous post: 100 Gardening Projects! Sounds fantastic. We having a progressive dinner and I’m having the appetizers…this sounds like a perfect “signature” cocktail for the event. Cheers! I had this Cucumber Gimlet at a restaurant and asked the bartender if he would give me the recipe. He did so here it is. 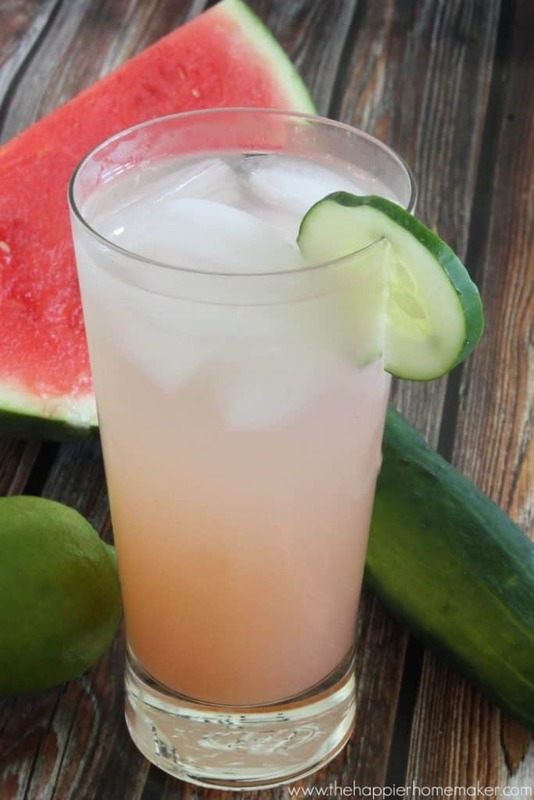 You will need Cucumber Vodka or make it yourself ( 1 English cucumber peeled and seeded, 1 lemon rind and 1 bottle of vodka, put in a pitcher or jar and let sit for 48 hours, then strain and pour back into vodka bottle. I refrigerate mine). The gimlet recipe is 1 oz. simple syrup, 1 1/2 oz. cucumber vodka and 1 oz fresh lime juice or roses lime juice. I have to say it is pretty tasty!! Have fun. I tried making this, but it keeps turning out really bitter. I tried cutting off the skin of the cucumber on the second one because someone had mentioned the skin can make it more bitter, but it’s still way more bitter than it should be. Any suggestions on what I can try?